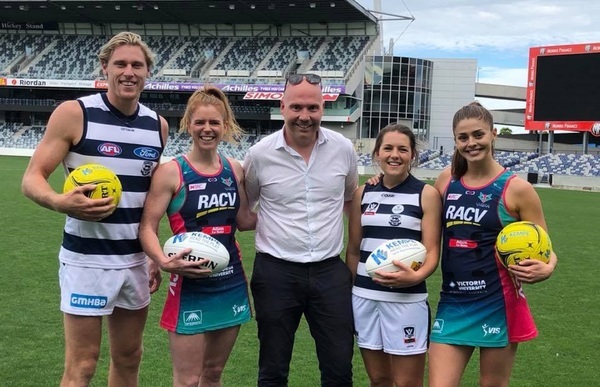 SPORTING PROWESS: Armstrong United Football Club president Michael Dower with Cats defender Mark Blicavs and forward Danielle Orr, and Melbourne Vixens goal attack Tegan Philip and defender Chloe Watson. Armstrong United Football Club president Michael Parker has put in time, sweat and money to make sure his two girls can play soccer. “I was keen to get a club up and running for my kids,” the Club Legend nominee said. Michael helped found Geelong’s newest soccer club, kicking off seven Armstrong Creek teams this year. The long-time player lives and breathes the beautiful game at Armstrong United, helping with everything from purchasing equipment to painting lines. “There are a lot of things you probably don’t realise that happen behind the scenes,” he said. The central defender was even willing to take a pounding as fill-in goalie, like during last weekend’s 0-5 loss. “I’d much rather not but that’s all right,” he laughed. Michael looks out for his players off the pitch too. “My experience as a youth and health worker has allowed me to help some of our players who might be struggling,” he said. Michael will vie for $5000 each for himself and Armstrong United in Viva Energy’s 2018 Club Legend Award, which has a total prize pool of $50,000 for local clubs and their volunteers. He hoped to use any prizemoney for portable change rooms or storage. Nominations for the awards are open at clublegend.com.au until 3 August.